Another holiday, another recipe. 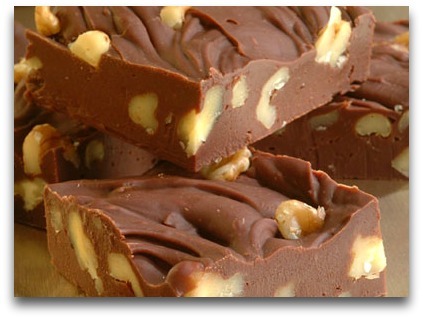 Today is National Nutty Fudge Day. My Aunt Annie made the best fudge in the world, but now that I know more about candy nomenclature, I think she actually made truffles. They were dark chocolate balls rolled in cocoa. I'll always remember her truffles as fudge. However, I had my first taste of the 'real' fudge down the shore in Atlantic City. Fudge was sold along with Salt Water Taffy at many of the Boardwalk candy shops. Yum! According to Wikipedia, the main component of Fudge was similar to the traditional recipe for Scots Tablet found in The Household Book of the Lady Grisell Baillie (1692-1733). The term 'fudge' is often used in the UK for a soft variant of the tablet recipe. One of the first documented examples of American fudge (containing chocolate!) was found in a letter written by Emelyn Batersby Hartridge, a Vassar College student, who wrote that a friend's cousin made fudge in Baltimore in 1886 and sold it for 40 cents a pound. Hartridge asked for the fudge recipe, and in 1888 made 30 pounds of the fudge for the Vassar Senior Auction. In The Candy Book (Alice Bradley, 1929) an entire chapter is devoted to fudge. Fudge is a crystalline candy, which means that, unlike lollipops, caramels, and taffy, crystal formation is the key to making great fudge. Tiny microcrystals of sugar in fudge give fudge its firm but smooth texture. The secret to successful fudge is getting these crystals to form at just the right time. Fudge is one of the rare exceptions to the rule that sugar crystals are not desirable in candy. Tiny microcrystals in fudge are what give it its firm texture. When the crystals are small enough, they don’t feel grainy on your tongue, but smooth. While you ultimately want crystals to form, it's important that they don't form too early. Now it gets tricky! The key to successful, nongrainy fudge is in the cooling, not the cooking. If you disturb the cooling fudge during this cooling phase you increase the potential for larger crystals (seed crystals) of sugar to form too early and thus a grainy fudge results. O.K. this is too much for me to take in, not being a candy maker. So how to make fudge relatively easy? Here are three recipes. Butter two 9 x 9 inch baking pans and set aside. In 4 quart saucepan, combine sugar, salt, butter, and evaporated milk. Stir over low heat until sugar dissolves. Bring to boil, and cook for 6 minutes. In heavy saucepan over low heat, melt chocolate chips with sweetened condensed milk and salt. Remove from heat; stir in walnuts and vanilla. Spread evenly into aluminum foil lined 8 or 9 inch square pan. Grease 8 by 8-inch pan with butter. In heavy-bottomed saucepan, combine sugar, chocolate, 1-1/2 Tbsp butter, half-and-half, and corn syrup. Over medium heat, stir with a wooden spoon until sugar is dissolved and chocolate is melted. Remove cover and attach candy thermometer to pot. Cook until thermometer reads 234 degrees F.
Remove from heat and add remaining butter. Do not stir. Let mixture cool for 10 minutes or until it drops to 130 degrees F.
Add vanilla and nuts and mix until well-blended and shiny texture becomes matte. Let sit in cool dry area until firm. And, there are websites that are just devoted to fudge. Fudge-Recipes.net and Fudge-Recipes.com and Fudge Recipe Collection. In addition there are many, many other nutty chocolate fudge recipes on various food blogs, including this one! Have a Nutty Fudge Day!